This is the fifth part of our Plesk Tutorial Series. If you're configuring a new VPS we recommend starting with part 1. 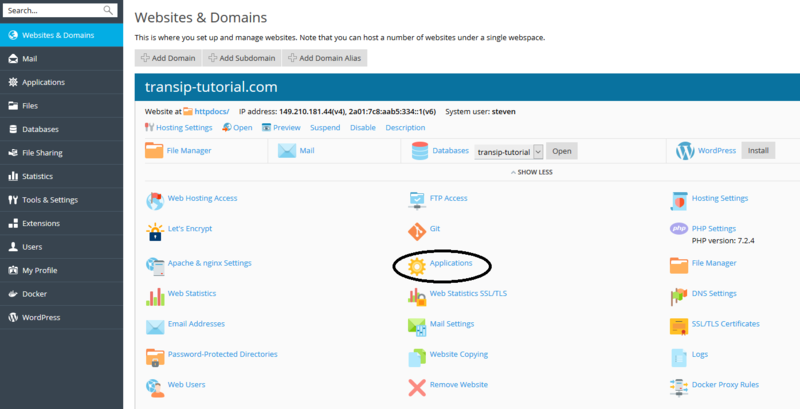 In this chapter we show you how to upload your website to your VPS. To upload your site, you can either use FTPS or the Plesk File Manager. Plesk offers you useful tools to quickly install a CMS system. We explain how to install WordPress, Drupal and Joomla with these tools at the bottom of this article. Websites often use an SQL database. In this part, we show you not only how to upload a website, but also how to also create a database and import your existing database into it. Don’t use a database for your website? After uploading your site, go directly to chapter 6 to set up your mail. Plesk uses phpMyAdmin to manage databases. 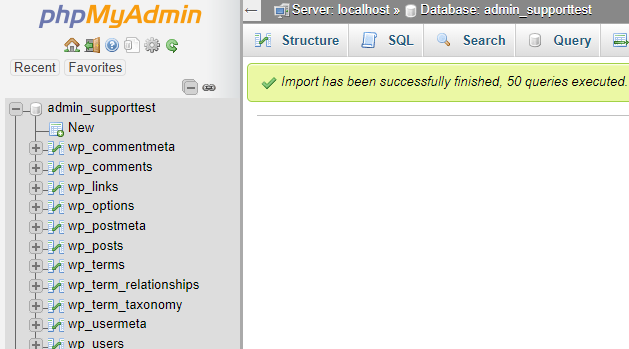 Before you can use phpMyAdmin and import your database, you must first create a database. In this article we explain how to install your own SSL certificate or Let's Encrypt in Plesk. Plesk is automatically configured to use FTPS. You do not need to make any configuration changes and you can directly start using FTPS. FTPS is more secure than FTP and uses an SSL connection. Plesk uses automatic self-signed certificates for this FTPS connection. Further explanation about FTP, FTPS, SFTP and related terms can be found in our article on the differences between FTP, FTPS and SFTP the differences between FTP, FTPS and SFTP. We use the FileZilla program in this manual and recommend using FileZilla to follow these steps one by one. 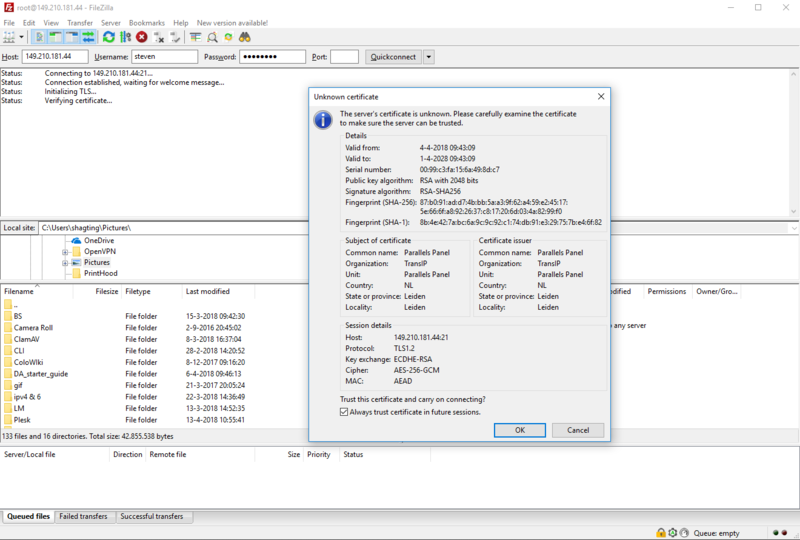 Start FileZilla and click on 'File'> 'Site Manager'> 'New Site' and enter the following data as shown in the example below (but with your own data) and click 'Connect'. Host: Fill in the IP of your VPS. Port: Use port 21 here. Plesk is configured to use FTPS over port 21. Protocol: Select the 'FTP - File Transfer Protocol'. Encryption: Change this option to 'Require explicit FTP over TLS'. For optimum security this is mandatory and not optional. User: The moment you add a new domain to Plesk, you add a user (such as after logging in for the first time in Plesk, of adding a new domain). You use the name and password of that user for FTPS. You will be greeted by the message as shown in the screenshot below. Select 'Always trust certificate in future sessions' and click 'Ok'. 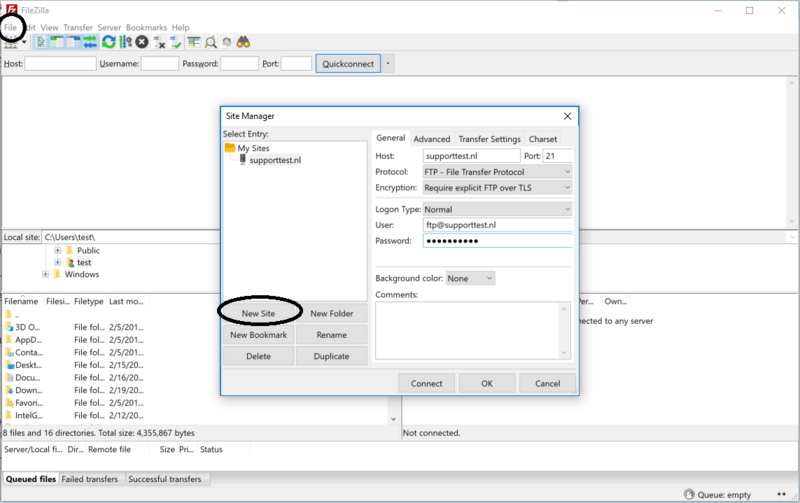 In FileZilla, navigate from 'Local site' to the folder on your computer where your website is located and click on 'httpdocs' under 'Remote site'. 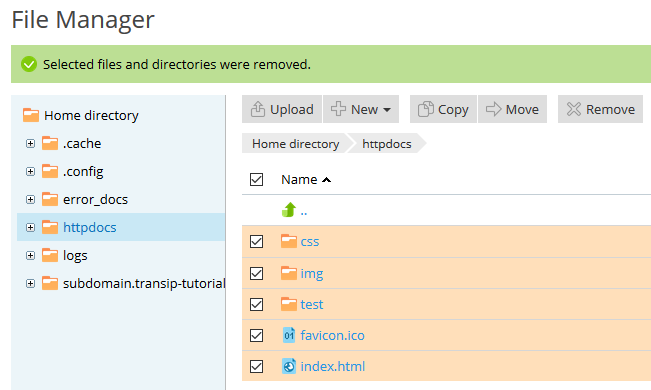 In case of a new VPS, you will see that the httpdocs folder already contains several files and folders. These are the files for the default site that you see when visiting your domain. Remove the default folders and files and then under 'Local site', navigate to the folder on your computer where your website is located and drag the entire content to the httpdocs folder. Log in to Plesk and go to 'Websites & Domains'. You will see an overview as shown below. Click on 'File Manager'. You will now see an overview of the folders and files in the 'httpdocs' folder. In case of a new VPS, there are already several files and folders in the httpdocs folder. These are the files for the default site that you see when visiting your domain. Select all files by checking the box in front of 'Name' and click 'Remove' to delete the default files. Click on 'Yes' if confirmation is requested. Click 'Upload' and navigate to the folder on your computer that contains your website. Select all the files you want to upload and click on 'Open'. When the upload is finished, the content of your httpdocs folder shows the files you have just uploaded. Tip: If your site is packed in a .zip file, you can upload the .zip file, select it by checking the box in front of it, and then click on the 'Extract Files' button to extract the content directly. Log in to Plesk and go to 'Databases'. If you have more than one domain linked to your Plesk, first select the domain you want to create a database for. You will see an overview as shown below. Click on 'Add Database' to create a database. Please note: This overview will be empty if you have not created any databases yet. A database was created for the domain that you added during the ‘logging in for the first time in Plesk’ step, but it is not actually linked to your site yet. Click on 'Assign this database to a site'> select your site > 'OK' to use this database. Fill in the fields as desired as shown in the example below and click on 'OK' to create the database. Make sure you keep the database name and login details somewhere safe. Database name: Choose a name that fits with what you use it for. 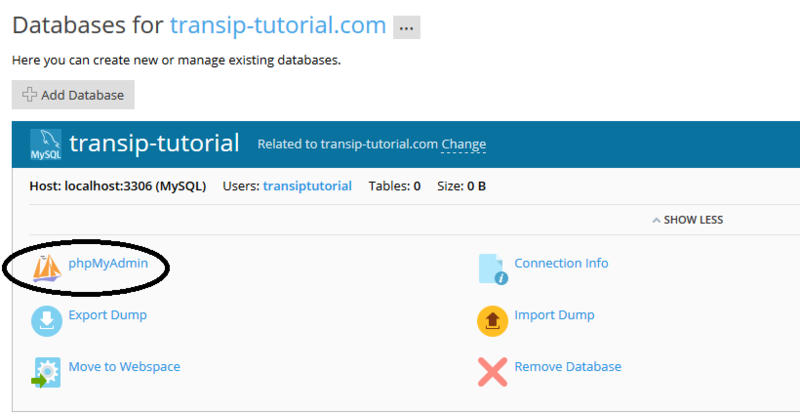 In our example we name the database transip-tutorial because it is going to belong to the domain transip-tutorial.com. Related site: If you want to link the database to a website, select the relevant website here. 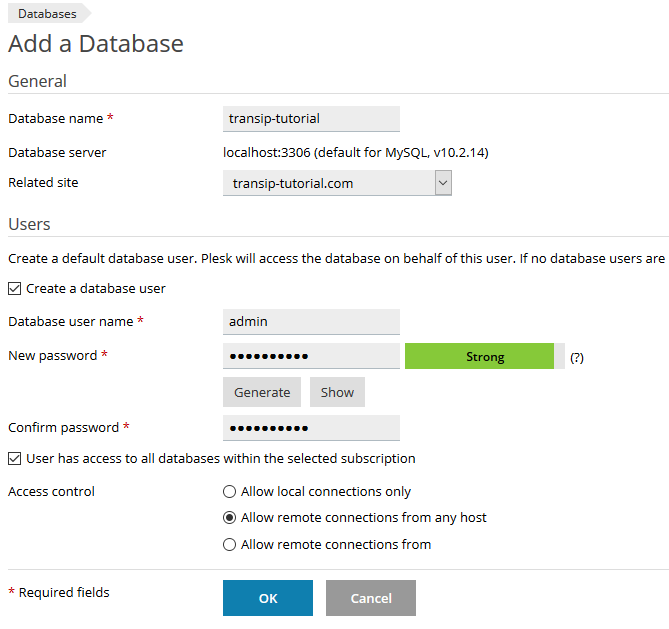 Create a database user: We recommend creating one user per domain, but you are free to create a unique user for each database. User has access to all databases within the selected subscription: This confirms that you want to use this user for all databases of this specific domain. Access control: Here you specify who can access the database: only you, any IP, or specific IPs. For database management, Plesk uses phpMyAdmin. Follow the steps below if you want to import an existing database. Log in to Plesk and go to 'Databases'. If you have linked more than one domain to your Plesk, first select the domain you want to create a database for. You will see an overview as shown below. Click 'phpMyAdmin' to automatically log into phpMyAdmin (Plesk will automatically log you in this way). You will now enter the main screen of phpMyAdmin. Click on the name of your database in the top left and click on 'Import'. In the example below this is 'admin_supporttest'. 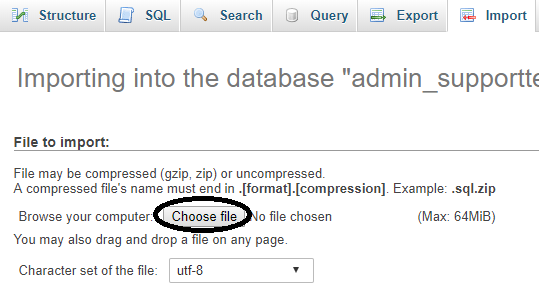 Click on 'Choose file' and select your database on your computer. Click on ‘Go’ at the bottom left to upload your database to your VPS. You will see a success notification and you will immediately see the tables in your database in the left overview. Please note: if your site uses a database, do not forget to check that you set the correct database name, database user, server, and associated password in the configuration file on your site (e.g. wpconfig.php). Log in to Plesk and click on 'Websites & Domains'> 'Applications' (the applications button for the domain on which you want to install the CMS system). Alternatively, if you want to install WordPress, you can immediately click 'Install' behind 'WordPress'. Click 'Install' behind the CMS system that you want to install (any existing files will be overwritten). Plesk offers many more applications that you can use this way, for example Magento, but also tools for analysis of your website. It is therefore a good idea to look through 'Featured Applications' or 'All Available Applications' some time. Your website is now accessible to the entire world! Continue to the next section ‘Part 6: Creating and using email addresses' to create email addresses for your domain and to find out the email settings for your domain amongst other things, or go to ‘Part 7: Additional articles and other questions’ if you do not use email for your domain.